Maximum savings and optimal productivity can only be achieved by leveraging technology. Period. vMOX's in-house software development team is laser-focused on achieving our corporate mission and vision. That's how we ensure that our revolutionary optimization software and mobility portal remain industry-leading and exceed our clients’ expectations today and well into the future. Our technology platform combines multiple sources of data, aggregated via API's and system interconnection, with algorithm-driven software and automation to enable unparalleled cost optimization, unprecedented efficiency and pinpoint accuracy in data exchange. Our leading-edge portal puts the power of this technology in the hands of our clients with an easy to use interface that simplifies management tasks and provides enterprise-level reporting and analysis down to the individual line level. Backed by years of research, development and experience, our proprietary optimization software continually collects and analyzes data to proactively optimize your entire mobility operation in real-time. Our software employs modeling algorithms, usage and trending pattern analysis, and multi-scenario comparisons to explore all potential savings opportunities, and leverages our comprehensive database of carrier plans to ensure the lowest cost options available for all users, 24 x 7. Direct integration with carrier billing and operations systems, plus third-party corporate travel, human resources, finance, and service management systems, ensures that all data exchanged is as timely and accurate as possible. Receiving data from providers in this manner allows us to be proactive in our optimization and management approaches. Direct data exchange also enables us to submit orders directly to providers electronically, ensuring that all identified savings is realized as fast as service provider billing systems allow. And all data is kept protected at all times, and we've even published our corporate security policies to prove it. Put valuable information to work and eliminate wireless expense management headaches. 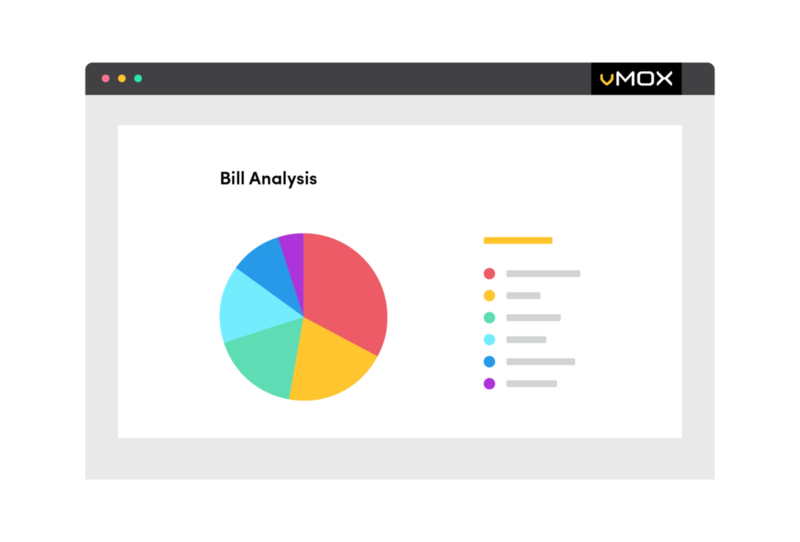 vMOX’s Mobility Portal is single-source web-based platform providing insight into, and management of, all aspects of your mobile environment. Developed, and continually enhanced, by our in-house development team, the portal is an easy to use interface that puts the power of our technology at your fingertips. Powered by our patented optimization technology and continuous electronic data exchanges with carriers and third-party providers, the portal simplifies mobility program administration and provides comprehensive reporting across all providers. Time consuming management tasks, including inventory tracking, device procurement, service moves, adds and changes, and trouble ticket creation and tracking are streamlined and automated by the portal, freeing your team up to focus on more strategic initiatives. Tedious, highly exact tasks, like adding general ledger codes to cost data from multiple service providers, are fully automated, with a speed and accuracy that you've only dreamed of. The portal also serves as your single, one-stop interface for comprehensive reporting across all providers and locations. Data from all of your providers is aggregated onto our platform, allowing you to create, view and download reports for your entire enterprise, eliminating the need to manually compile reports with data downloaded from individual carrier portals. A full range of standard reports are available, from company-wide down to individual line level, plus you can create custom reports any time to take your analysis to the next level. All data is kept protected at all times, and we' published our corporate security policies to prove it. Organize, analyze, and optimize spending across all providers. View and download reports on usage and spend by individual, group or geography, and detailed analysis and trend reports for your entire enterprise, regardless of provider. Allocate costs by general ledger cost center for invoice and expense reconciliation. Comprehensive service management and ticketing capabilities allow you to submit and track service orders, porting requests, trouble tickets, and billing inquiries directly to your service providers, and view provider-specific metrics and analytics, as well as archived bill data. Granular spend and usage reporting down to the individual user level helps control excessive use and drive accountability. Hierarchical reports give managers visibility into the activity of their team members, and automatic alerting sends notifications when usage thresholds are exceeded. Access a continually updated inventory of your mobile assets, with plans, features and contract status, plus early-term charge and upgrade eligibility information. Activate, deactivate or re-assign devices, and offer employees a self-service option to order devices and accessories directly from service providers. Detailed reports, charts and analytics offer comprehensive visibility into all aspects of your environment, across all locations and providers. Customized alerting generates automatic notifications on unusual activity, allowing you to investigate and limit any financial impact.